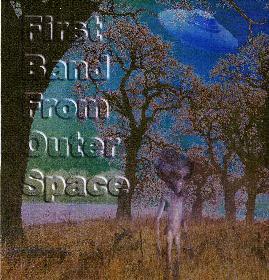 First Band from Outer Space - "We’re Only In It For The Spacerock"
This new Swedish band is continuing their journey to the forefront of Swedish space rock. This is the bands third demo CD and I become more impressed all the time. The band have recorded this in the rehearsal room with the help of Henke Udd and achieved a very nice sound. The band will soon go into the studio and record a 78 minute space rock classic. Remember the first 3 DarXtar CDs?? Well, this band is going back to that era of space rock but taking the voyage to a different universe. Fans of those Daxtar CDs will for sure enjoy this 37 minute ride. The CD begins with a five minute free form jam that leads into the excellent Sunrise song. The band has used the MOOG bubbles a bit more on this recording, which is nice. Sometimes Going Too Far Is The Only Way To Go follows and is a really nice space rock voyage showing excellent playing by all members. Johan’s voice really grows on you after a while as well. They then bring it back down for acoustic Sunrise II, which I thought was a great number before we blast off into a 20 minute or so cosmic jam. The band are currently working on a web site and hope to play their debut gigs this fall.